We may have just witnessed an important milestone in the awakening of the web. While this point may be controversial, I content that future exponential growth of the digital economy will eventually require getting humans out of the loop. If computing power continues to double every 18 months in accordance with Moore’s Law, utilizing all those cycles will eventually require computers to start talking directly to other computers, without the goal of assisting, informing or entertaining human beings. Why? Because human population is virtually flat and limits to human cognition mean there is only so much digital content people can effectively digest. According to a recent University of California study, the average US citizen consumes an estimated 34Gb of data daily, mostly in the form of TV & video games. Collectively, American households consumed 3.6 zettabytes of information of all kinds in 2008, the researchers estimated. While this seems like a lot and is likely to continue growing for some time as video resolution gets higher, our appetite for bytes will inevitably flatten out, particularly if we continue to get more of our information through mobile devices. If machine-to-machine communication will eventually need to pick up the slack in demand for the ever increasing bandwidth, how and when will it happen and what form will it take? To some degree it is happening already. For quite some time there has been a shaky alliance between news aggregators (e.g. Google News) and machine-driven decision tools, best exemplified by automated financial trading systems. The widely reported United Airlines incident last year showed just how risky this combination can be. For anyone who missed it, United Airlines stock plummeted from $12 to $3, losing 75% of its value over the course of a few minutes on Sept. 8th 2008, and in the process wiped out over $1B in shareholder value. It turns out the trigger was a small mistake by a Florida newspaper that accidentally reran a story from 2002 about UAL’s bankruptcy without a date, making it appear like it was fresh news. Within a minute, the automated scanning system of Google News, which visits more than 7,500 news sites every 15 minutes, found the story and thinking it new, added it to its breaking news stream. An employee at Bloomberg financial news saw the story and rebroadcast it to thousands of readers, quite many of whom follow United Airlines. Within minutes United’s stock tanked, largely as a result of automated trading programs that saw the price dropping and sold the stock to prevent additional losses. 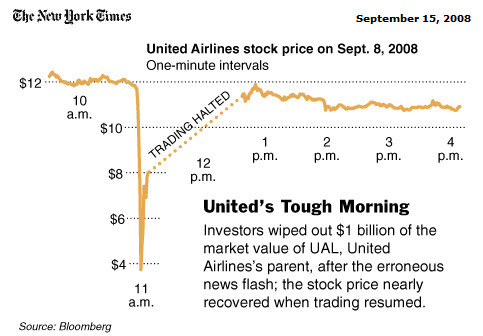 Once the mistake was cleared up and trading resumed, UAL’s stock recovered most of the $1B it had lost, but the incident was an important lesson for the burgeoning industry of automated news scanning and financial trading. What went wrong during the United Airline incident was a combination of human error and runaway automation that both propagated and acted upon the mistake. This is what happens when everything goes on autopilot and there are no human controls in place or those controls fail. Now in what could be an important (but potentially risky) step further. 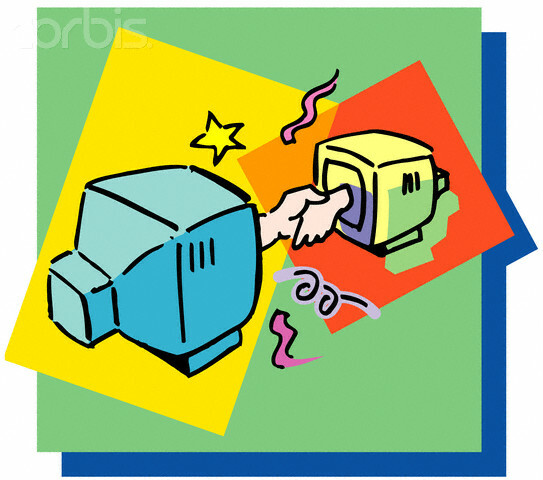 we are beginning to see computers acting as both the producers and consumers of content, without a human in the loop. In this case it is called computational journalism and it consists of content generated by computers for the express purpose of consumption by other computers. NewsScope is a machine-readable news service designed for financial institutions that make their money from automated, event-driven, trading. Triggered by signals detected by algorithms within vast mountains of real-time data, trading of this kind now accounts for a significant proportion of turnover in the world’s financial centres. Reuters’ algorithms parse news stories. Then they assign “sentiment scores” to words and phrases. The company argues that its systems are able to do this “faster and more consistently than human operators”. Millisecond by millisecond, the aim is to calculate “prevailing sentiment” surrounding specific companies, sectors, indices and markets. Untouched by human hand, these measurements of sentiment feed into the pools of raw data that trigger trading strategies. One can easily imagine that with machines deciding what events are significant and what they mean, and other machines using that information to make important decisions, we have the makings of an information ecosystem that is free of human input or supervision. A weather report suggesting a hurricane may be heading towards central America could be interpreted by the automated news scanners as a risk to the coffee crop, causing automated commodity trading programs to cause a rise on coffee futures. Machines at coffee producing companies could see the price jump, and trigger release of stockpiled coffee beans onto the market, all without a human hand in the whole process. Machines will be making predictions and acting on them in what amounts to a fully autonomous economy. This could be an alternative route to the Global Brain I previously envisioned as the end result of the TweetStream application. By whichever route get there (and there are likely others yet to be identified), the emergence of a viable, worldwide, fully-automated information exchange network will represent an historic moment. It will be the instant our machines no longer depend entirely on humans for their purpose. It will be a critical milestone in the evolution of intelligence on our planet, and a potentially very risky juncture in human history. The development of NewsScope is appears to be an important step in that direction. We live in interesting times. An automated system to match high-potential technologies with potential licensees. Using Synapse, OTT now uses a “market-push” approach, locating specific companies that are most likely to license a certain technology and then notifying the companies of the opportunity. Using the same product, OTT also found it could also successfully perform “market pull,” in which OTT can identify multiple technologies in its inventory in which a company may find interest. Apparently Reuters isn’t interested in just automating the process of generating and disseminating news, but technology as well. My fascination is as much with the process as with the events themselves. 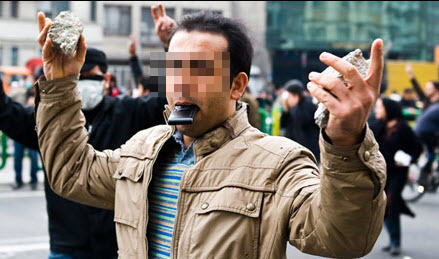 CNN, Reuters and the BBC are relying almost exclusively on unconfirmed posts by ‘citizen reporters’ sharing news, pictures & videos on services like Twitter, Twitpic & YouTube. We are experiencing the future of news, with the line forever blurred between those who make the news and those who share the news. For the first time we can experience news anywhere and anytime, as it happens. We are all so much more intimately connected than ever before. Global consciousness is awakening. We live in interesting times. Read more about Twitter’s critical role in the unfolding drama in Iran, and the potential downsides of using social media to instigate change.